The Double Featurette: "Kung Fu Panda" & "Flight of the Red Balloon"
I have wanted to write about Hou Hsiao Hsien's Flight of the Red Balloon for some time. I knew the idea that I wanted to use to connect the film to its pair (see below) but I could not think of a film that shared this idea (if you have better suggestions I would be glad to hear them!). In Flight of the Red Balloon, Hou brings his ever steady gaze to a small family in Paris made up of Puppet theater artist Juliet Binoche, her son and the Chinese nanny who takes care of him. The film is worth seeing if only for Binoche, whose performance as a loving and creative single mother verging on a mental breakdown is real and nuanced. The criticism of Hou's work has often been that his films don't go anywhere and are boring. That too often, his camera merely documents. His cinema is the cinema of flies on walls and therefore not worth watching. While it is true that conventional plots and three act structure do not appear in Hou's Work, I thoroughly reject this criticism. Yes, Hou does not often pass judgement on his characters or inject his own opinions into their lives. Yet it is clear in Flight of the Red Balloon, that Hou is aware of the fact that the director and camera is a lens through which we see the world that is presented and that watching a film of a family is not the same as being a literal fly on the wall. Shot after shot involve action that is seen reflected in mirrors, or through glass. Whether that be a mirror, a car window or the window of a restaurant. The action occurs through the filtering of different surfaces, leaving the audience with the question of how the filtering has affected what we see. How does the surface change our perception? So while the film is still quiet like his earlier works (check out Millennium Mambo, my personal fave), it is almost as if he is addressing this constant criticism of his work and presenting many different lenses. However, these lenses do not necessarily create different opinions. Ultimately it is as if Hou is saying, no matter how much the camera moves and how much is reflected and filtered, the action does not change and it is the audience who should interpret what occurs. So how in the world does Hou Hsiao Hsien, darling of the independent international cinema world connect to Jack Black, Angelina Jolie and the 60 Million $$ opening weekend film that is Kung Fu Panda? In many ways, it doesn't at all. I can't even say that Kung Fu Panda is a particularly good film. 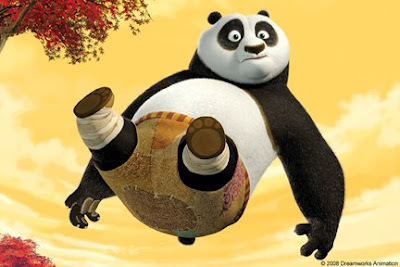 Certain scenes, especially one in which Po the Panda, voiced by Jack Black, and Master Sifu, voiced by Dustin Hoffman, fight over one last dumpling, are whimsical and well drawn, but for the most part the film is just a nice way to spend a hot summer afternoon. Seeing films like Kung Fu Panda make you realize just how amazing Pixar is (I am really looking forward to WALL-e later this month). I had pretty much shelved writing about Flight of the Red Balloon by the time I went in to see Kung Fu Panda so imagine my surprise to find a meditation (well sort of, in a kids movie big lesson kind of way) on the idea of surface and perception!! (SPOILERS AHEAD!!) In one crucial scene Po opens the infamous dragon scroll only to find it blank(!!!). The magical secrets of kung fu are in reality only a piece of shiny paper. This is of course, a disappointment, but not unpredictably, Po realizes by seeing his reflection in the shiny paper that he already has all the skills he needs to succeed. The message here is simple and heartwarming: you are what you are and that is all you need to be. Here, the crucial surface produces a simple reflection. The reflection does not lie or distort. And yet, this simple reflection is the key to the message of the film. The exact and undistorted reflection of the reality Po already knows is what changes everything. So the surface even though it changes nothing, changes everything (so in Flight of the Red Balloon, is there in fact a change in our perception after viewing he undistorted reflection?). Regarding filtered images, it may be interesting to pair Flight of the Red Balloon with My Blueberry Nights, which is loaded with images of action behind windows, doorframes, and busy, foreground human movement constantly separating the viewer from the main characters (not to mention a great deal of overlapping dissolves). Not reflections, per se, but still clearly selective in what we see of these characters and their situations and how we see it, and therefore not "merely documents". I think Flight of the Red Balloon seems to be playing at this when we find out that Song is in fact working on a remake of the original Red Balloon, suggesting that FotRB is actually her finished film, creating yet another surface of separation for our perception. Personally, I don't think the makers of Kung Fu Panda are to be underestimated with regards to the feelings they may (or may not) have about cinematic surfaces. When Po first enters the temple, one of the comments he makes is pretty sly (and telling): "I've only seen paintings of this painting!"